Size of this preview: 800 × 540 pixels. Other resolutions: 320 × 216 pixels | 640 × 432 pixels | 1,112 × 750 pixels. 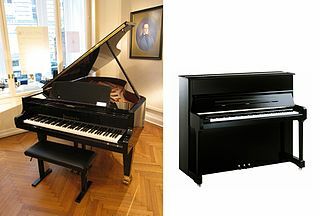 English: A photo of a Bösendorfer grand piano and a photo of an upright piano. Esperanto: Pianego kaj pianeto, kompara bildo. La pianego estas de marko Boesendorfer, de Vieno. 05:25, 26 December 2012 1,091 × 750 (392 KB) SudoGhost Unexplained change. It'll be reverted each time, since you've been blocked multiple times for it before. Don't allude to discussions...discuss. 22:40, 20 December 2012 1,200 × 750 (444 KB) Pianochanging To the person behind both "SudoGhost" and "SudoKamma", Again again again: Read User talk:AndreasPraefcke#Modified picture and please read the description of the picture. 21:48, 9 December 2012 1,091 × 750 (392 KB) SudoGhost Reverting; there was no discussion there, and no rationale for changing the image. 14:51, 1 December 2012 1,200 × 750 (444 KB) Pianochanging To the person behind both "SudoGhost" and "SudoKamma", Again again: Read User talk:AndreasPraefcke#Modified picture and please read the description of the picture. 07:22, 23 November 2012 1,091 × 750 (392 KB) SudoKamma Reverting. There was no discussion on that talk page, you left a vague comment. 16:40, 14 November 2012 1,200 × 750 (444 KB) Pianochanging Undo unexplained revision 82750019 by SudoGhost (talk). Again: see also User talk:AndreasPraefcke#Modified picture. And please read the description of the picture. 02:33, 11 November 2012 1,091 × 750 (392 KB) SudoGhost Unexplained change. 14:14, 7 September 2012 1,200 × 750 (444 KB) Pianochanging Undo revision 76845590 by SudoGhost (talk) reverted unexplained edit and ignorement of link below in history - "per User talk:AndreasPraefcke#Modified picture"